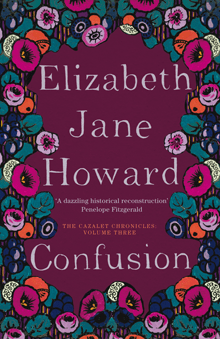 This, the third in the five-book series by Elizabeth Jane Howard which is The Cazalet Chronicles, covers March 1942 to July 1945, again we see the family’s experiences through the teenage eyes of Polly, Louise and Clary. Much has changed now as the war progresses, particularly affecting the role of women, the breakdown of class barriers, the empowerment of working women and educated poor. These books are quite a social history of a period which more often is the reserve of thrillers and spy novels. Elizabeth Jane Howard has a subtle hand when it comes to observing relationship, such as Polly’s observation after her mother’s death: “It was possible to believe that she was gone; it was their not ever coming back that was so difficult.” Confusion is in part a study of the grief of Polly and her father Hugh; and that of Clary and Neville, whose father Rupert has disappeared in action in France. Clary continues to believe her father is still alive, though the rest of the family quietly accepts his death. Then word from France brings a sliver of hope. Clary grieves for the father she remembers as a child, writing a daily diary for him, and not as the soldier he died as. The other theme in Confusion is love, or the lack of it. Louise’s story is not about death but about young love, expectations and marriage and the realization that her husband Michael is more strongly wedded to his mother Zee than to her. There are war-time affairs, some lust, some love, and with all of them comes the confusion of uncertain times, stress and the pressure of living life ‘now’. War seems ordinary in the everyday sense, but the Cazalets are living through extra-ordinary times. The familiar characters continue from the first two books, their story arcs going through radical change now as the war progresses and everyone’s life is changed forever. Read my reviews of The Light Years, the first book in The Cazalet Chronicles and the second, Marking Time. I have not heard of these books before, but it sounds like an interesting series. I’ve read the first two; I must get to the rest. As a teenager I was obsessed with Barbara Pym and EJH. They seemed beautifully English to me, growing up on a Scottish island and reading whatever I could get my hands on!